Some diets, reviewed on pages of this web-site, have been tested by our experts personally, so they can testify their efficiency. One of these programs is the six-day program, which will be discussed below. It really helps to lose a few pounds in less than a week, and you will not experience hunger during this period. Six-day diet is an eating plan designed for six days. Every day you need to eat the undermentioned foods in every two hours from 8 a.m. until 8 p.m.
India has rich cultural and spiritual traditions. This country has become the founder of a vegetarian diet, which adheres to the principles of a huge number of people in all corners of the world. 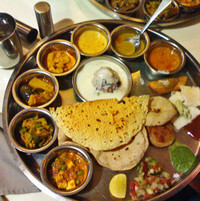 The main condition for the so-called Indian diet is taboo to eat meat in any form. The diet is based on eating many dairy products and vegetables. Indian diet is rather efficient for losing weight, and therefore it is recommended for prolonged use. It is low-calorie and should be followed during 12-18 days. It helps to lose from five to six pounds.